A survey carried out by Afro Barometer in collaboration with Campaign for Good Governance (CGG) has revealed that the National Electoral Commission (NEC) performed its duties as a neutral body, guided only by law. NEC was saddled by criticisms, especially from the now opposition All People’s Congress (APC) and a handful of civil society organisations that questioned NEC’s neutrality in the run up to the March 2018 multitier elections and crucial presidential run-off. 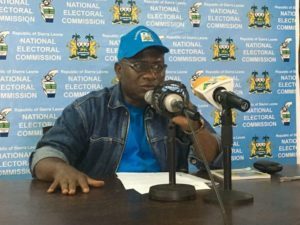 They claimed, among other things, that the electoral body was not up to the task in conducting the polls, adding that electoral officials had sided with the then opposition Sierra Leone people’s Party (SLPP). Thy also alleged that NEC was acting contrary to laws governing the conduct of elections, while the polls were not free and fair. However, during the survey which was conducted between 9 and 28 July 2018, almost three quarters (73%) of Sierra Leoneans interviewed agreed that NEC performed its duties with neutrality through the guided law. Also, eight out of ten citizens interviewed (55%) during the survey indicated that the 2018 multitier elections were completely free and fair, whilst 26% were of the opinion that it was free and fair but with minor problems. Presenting the findings at the Ministry of Information conference, CGG Programme Officer, Ibrahim Sesay, stated that this was the seventh round of the Afro Barometer survey findings but the third on Sierra Leone specifically, with the first having been conducted in 2012. Sesay said the survey focused on the perceptions of citizens with regards democracy, elections and the issue of dual citizenship in the country. He said that according to the survey, Sierra Leoneans were split on whether dual citizens should be allowed to vote, with a majority (56%) stating that dual citizens should not be allowed to stand for elected office. According to the CGG programme officer, the sample in Sierra Leone was 1,200 adult citizens in the north, south, east and west. In his response, Minister of Information and Communications Mohamed Rahman Swaray welcomed the findings of the survey, adding that the government would always look forward to listening to people’s perceptions. “As a government, we welcome this third round of Afro Barometer findings and we are graciously looking into issues in it moving forward. The perceptions on democracy, elections and citizenship are very insightful headlines. We are going to use it as a signpost to our development and engagements,” he said. Minister Swaray noted that the indication from Sierra Leoneans that the elections were free, fair and credible was welcoming as they have had issues about few losers questioning the legitimacy of the presidency and the present government. He urged Sierra Leoneans to move beyond the elections and confront the main challenges of governance facing the country.